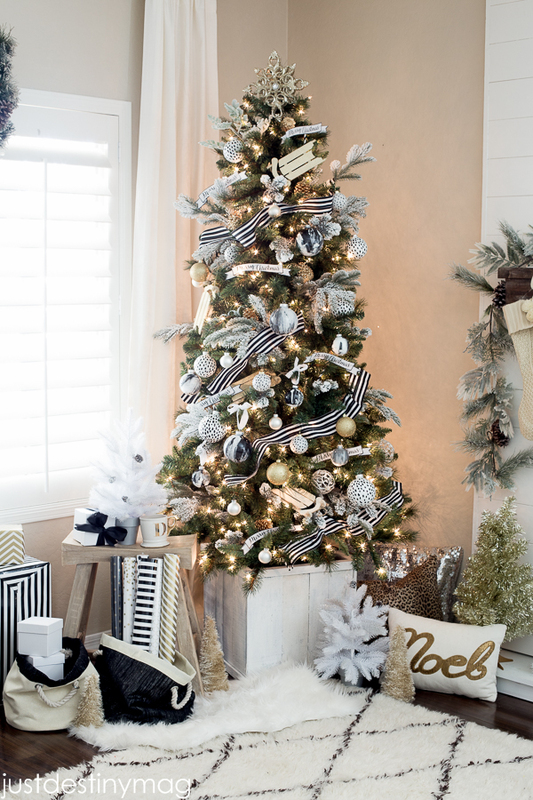 I’m so excited to finally reveal my MICHAELS DREAM TREE! 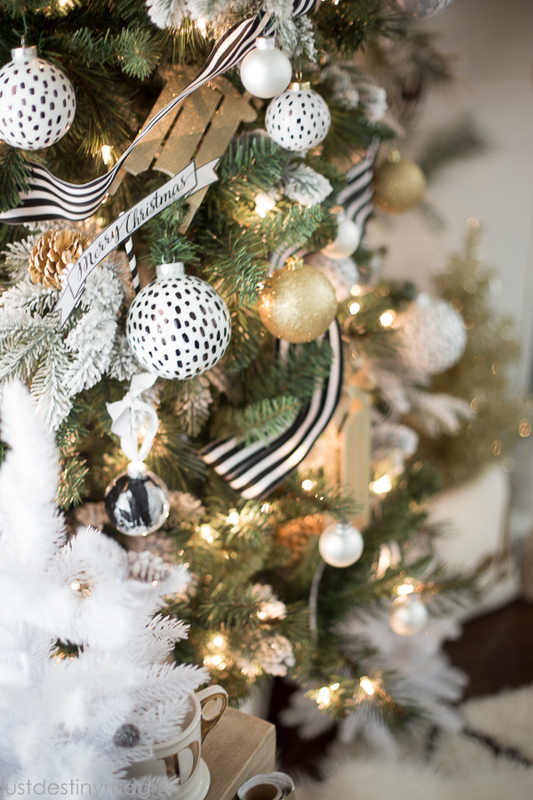 It was so much fun creating this black and white tree with a little touch of gold. Black and white is one of my all time favorite color schemes. It’s always in style and never gets old. 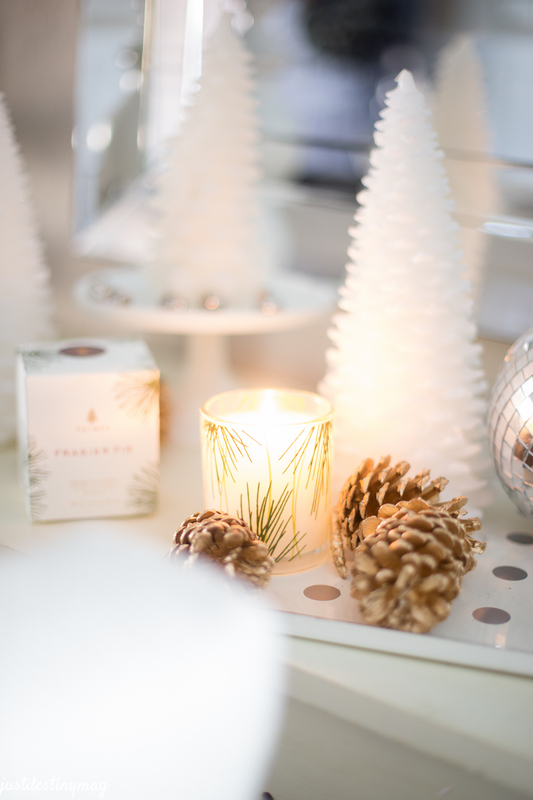 Adding neutral metallics like gold, silver and bronze gives it just a little extra glam! If you LOVE color you can still get a look just like this. 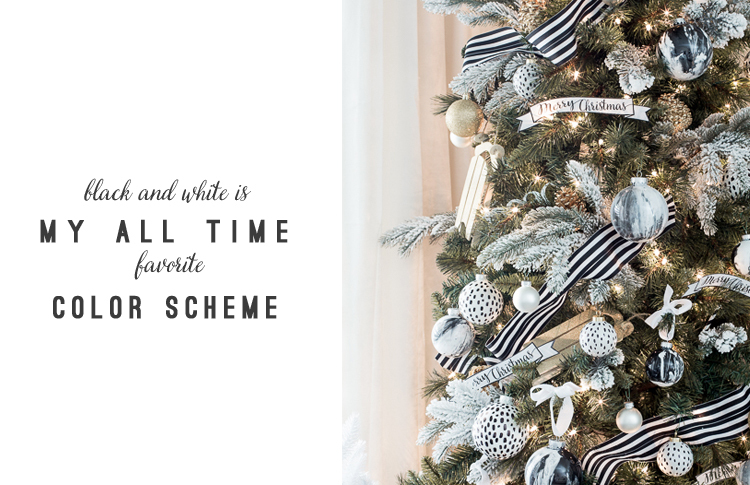 Just add one or two of your favorite colors and BAM you got yourself a dream tree. When it came to creating this tree I wanted it to be cohesive. I feel like monochromatic rooms seem to invite those relaxing and calming atmospheres and that’s exactly what I wanted. To start things off I added some flocked branches I picked up from Michaels floral section to my 7ft Willow Christmas Tree to brighten it up a bit. 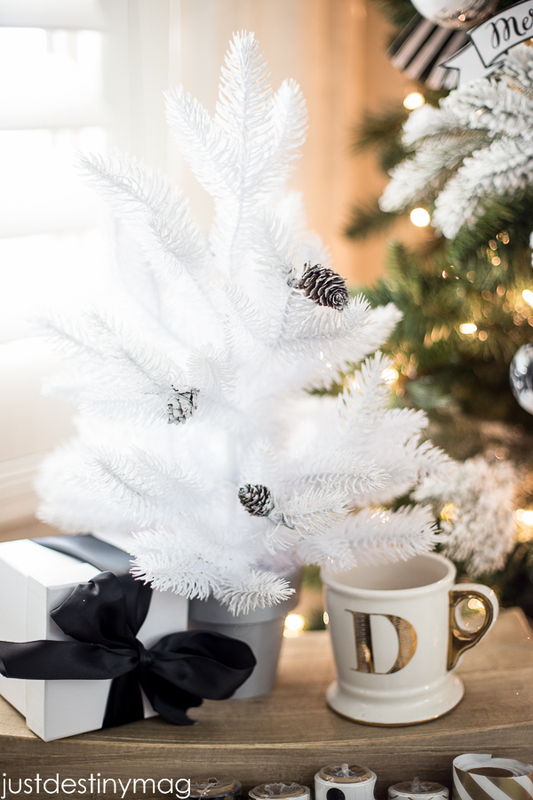 This is a great way to get a white flocked look with out spending the extra money! 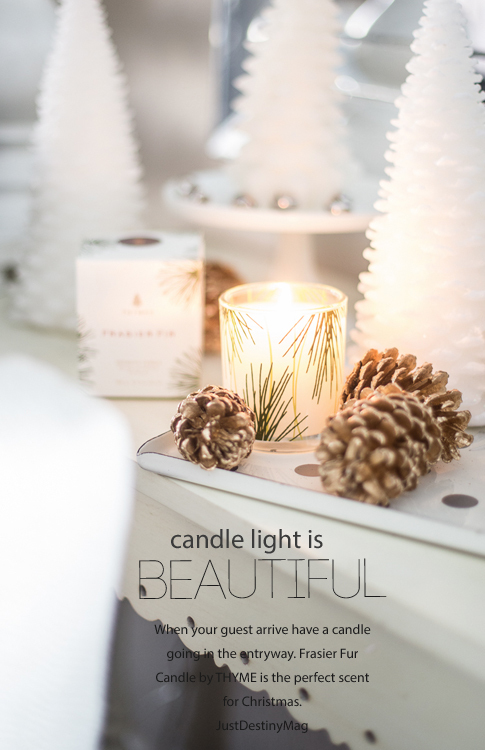 Place several of them in the tree for a winter feel. 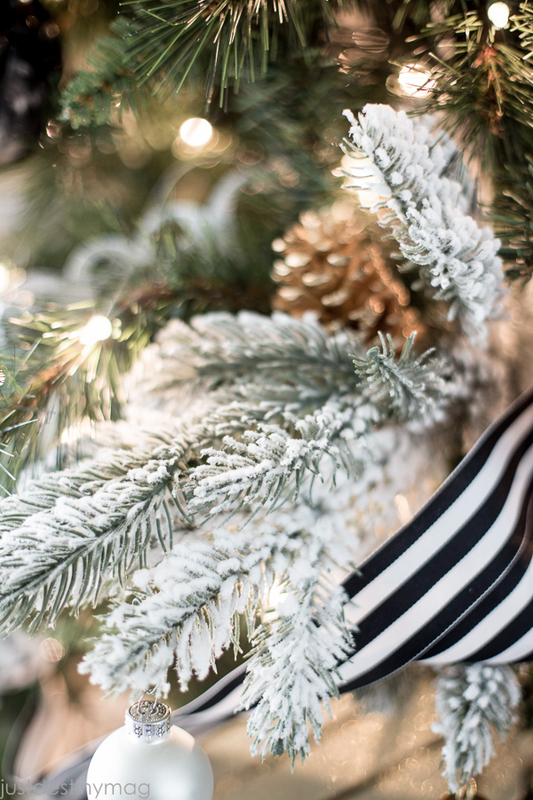 I also added some other gorgeous trimmings like black and white striped ribbon, handmade banners and handmade ornaments! 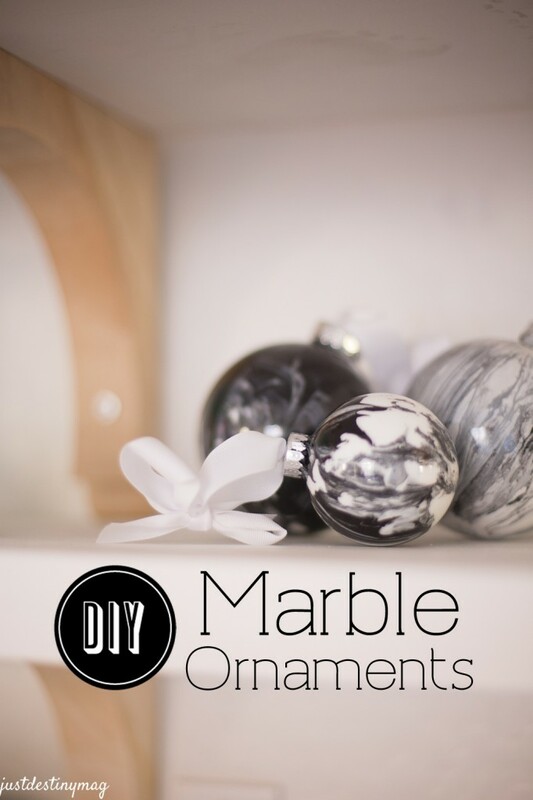 These faux marble ornaments were so fun to make. Look out for the tutorial coming up in a couple of weeks! 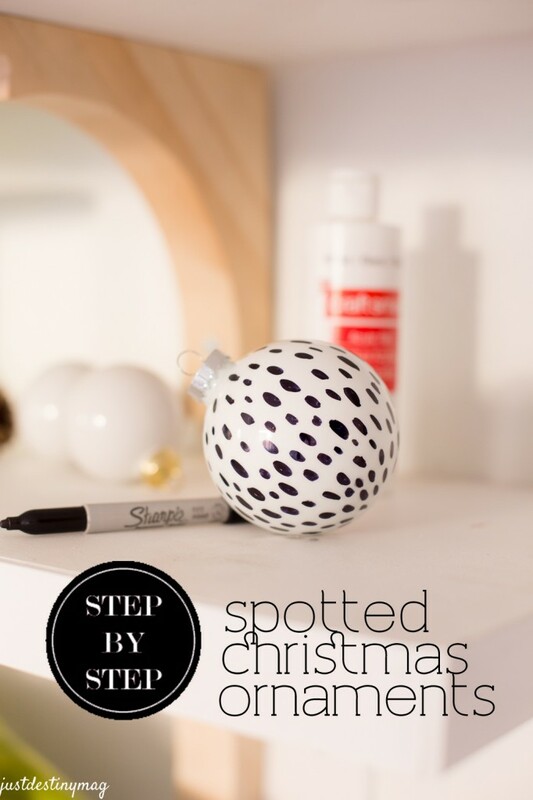 I will also be showing you to make these dotted ornaments out of porcelain and glass ornaments from Michaels! 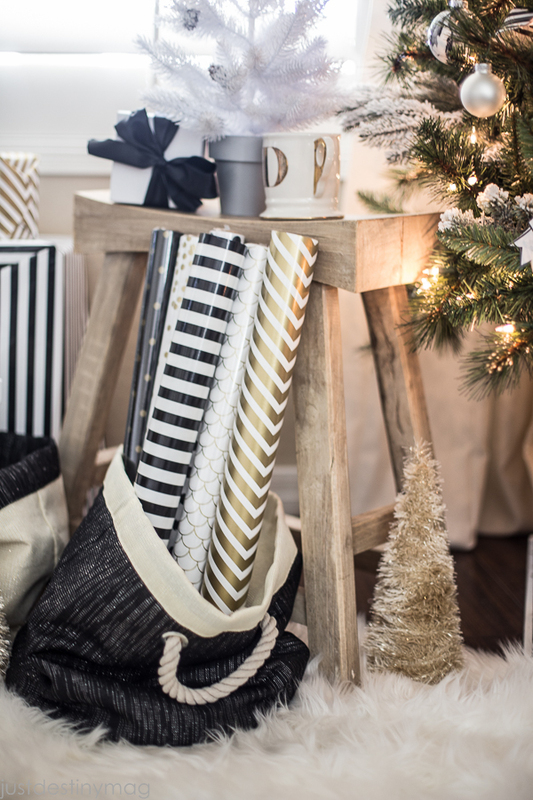 These wrapping papers are going to go great under the tree! Only $2 each folks! Plus there is a lot of paper on these rolls! I was so excited to come across and entire black, white and gold section! You can find these in the bargain section at Michaels. Michaels has a lot of fun things going on this month! 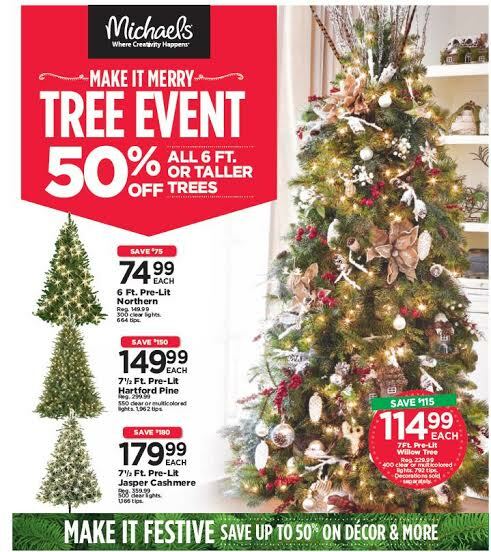 Head into Michaels Nov. 2 through Nov. 8 for the Make It Merry Tree Event – 50% off all trees 6 ft. or taller!! That means this WILLOW TREE!! Just Destiny Mag is a Michaels Maker, who participates in monthly challenges sponsored by Michaels Stores. So inspiring! 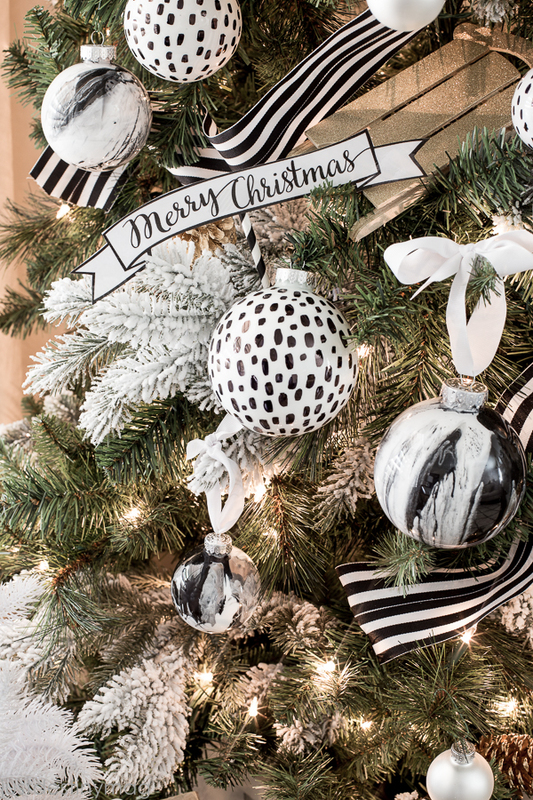 Love the black & white idea! just love the tree that you put together. perfect! 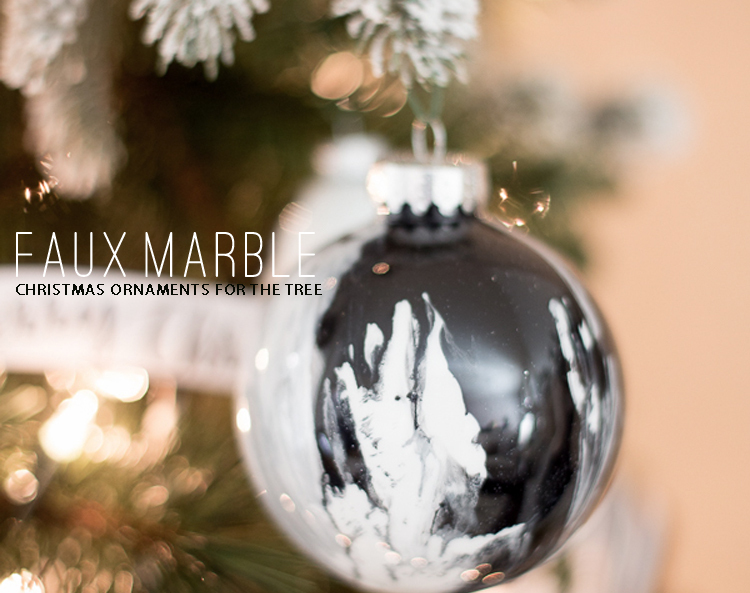 So pretty…love the tree! I must run to Michaels and get some of that wrapping paper! What is the white stand around the tree? Did you make that or purchase it? The tree looks beautiful! Hi! That’s something that I made! I will have a tutorial soon! Yay! Soon please! Love it! The tree is on sale INSTORE for only 99 bucks! Good luck and thanks Amanda! Ooooohh so pretty! I really like the ornaments that you made. 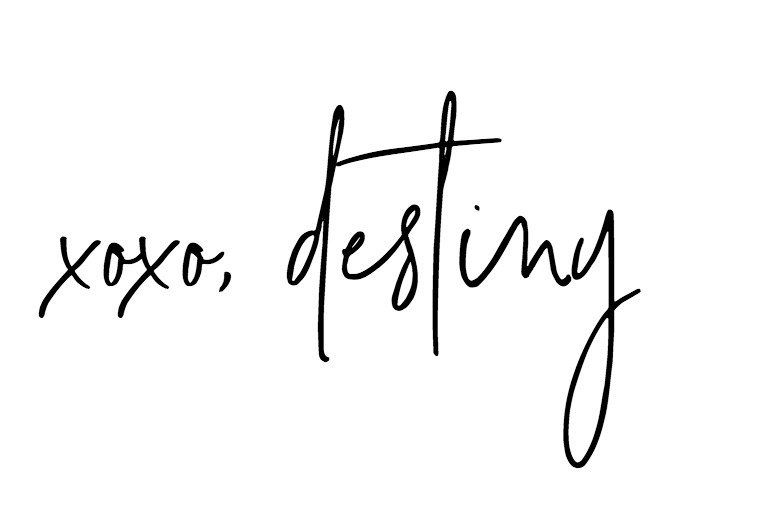 Look forward to seeing how you did it! So gorgeous! 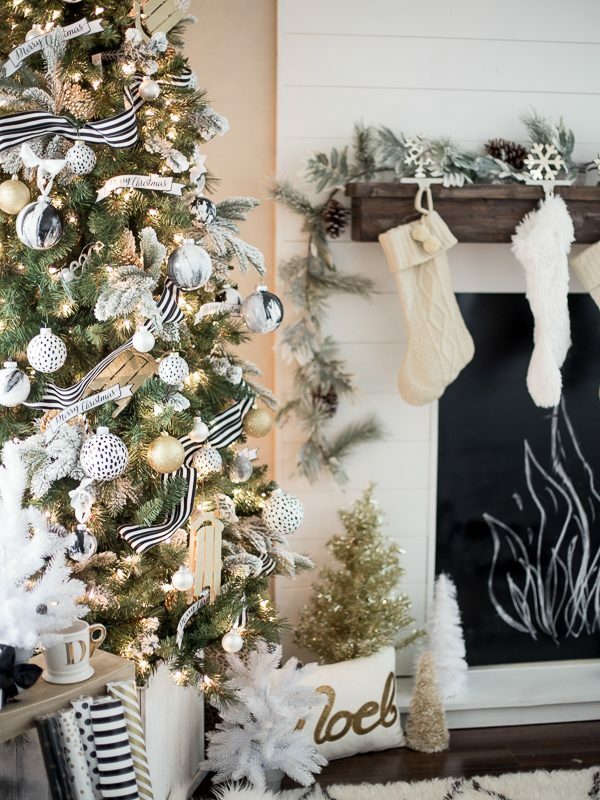 Where are the stockings and the garland on your mantle from? Gorgeous! 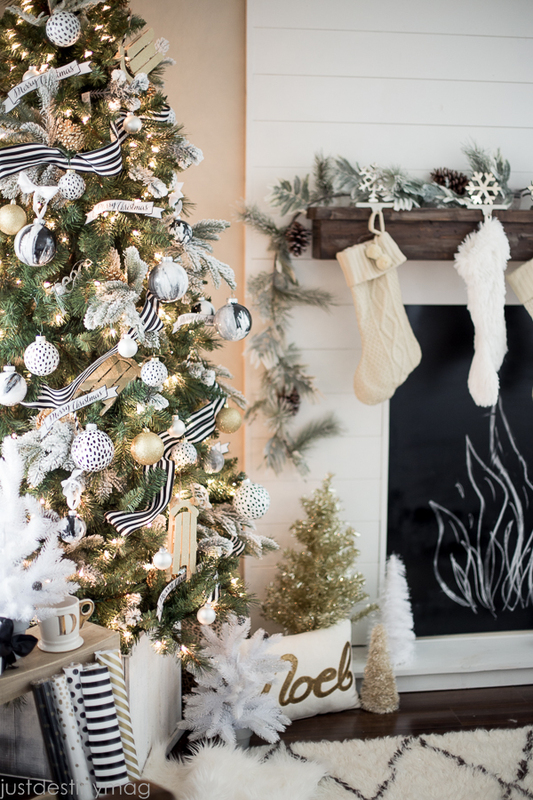 Where are your stockings and the garland on your mantle from? 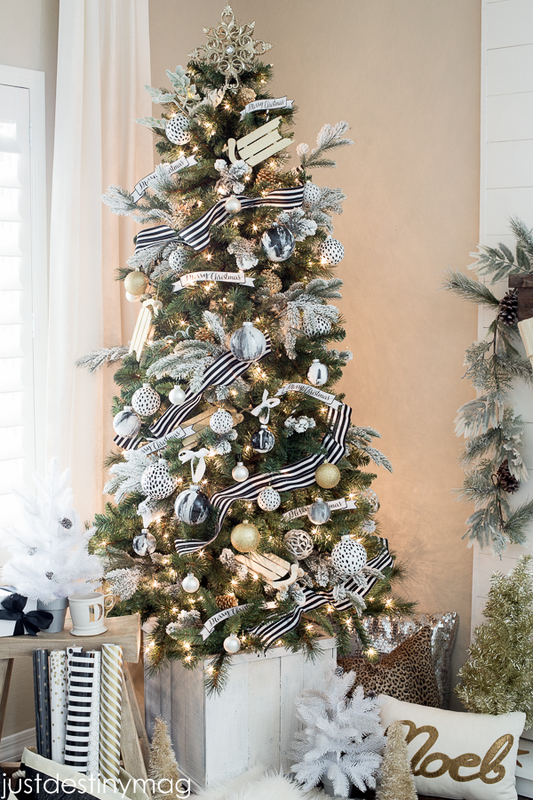 I love black and white stripes and just adore the ribbon around the tree! It looks like the ribbon is actually two pieces side by side or sewed together? Or is it just one width of very wide ribbon? Thank you! Yep, I fused them together to make a thicker ribbon! How did you fuse them together?? I am in LOVE with your tree and so inspired by it. I am having the hardest time finding ribbon as thick as yours. Thank you!!! I just saw that you sewed them together. I should have kept reading! Thanks! Gorgeous tree! Did you sew two piece of the ribbon together in order to create a thicker ribbon garland? Thanks! Love this tree!! Did you make the Merry Chriatmas banners or buy them?? I’d love to be able to do the same for my tree! Where’d you get the noel pillow? LOVE this beautiful tree you created! Can you tell me where the gold sparkle ornaments are from? As well as the black & white ribbon? They are both from Michael’s! I think they are having a 50% off sale right now too! This is simply beautiful and breathtaking! Love it! Every year I try to do a tree that looks different from the previous year. 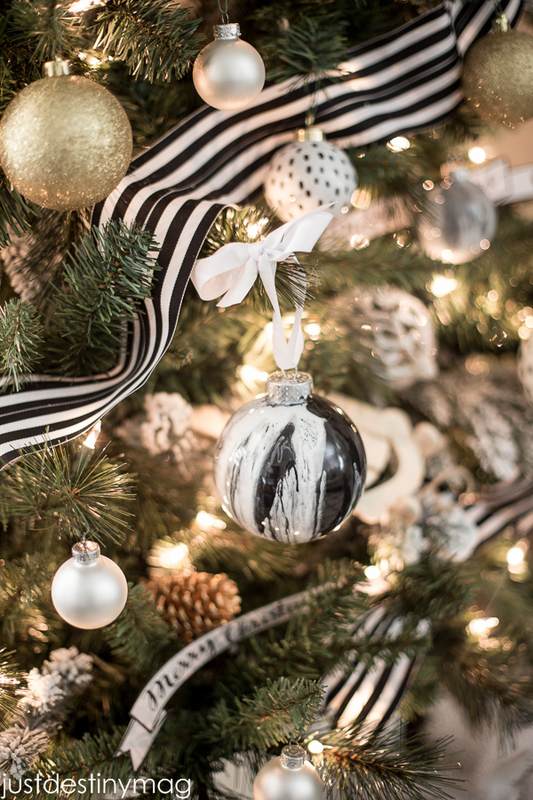 You’r black and white tree is so beautiful!!!! I am so inspired that I am definitely stealing this idea.